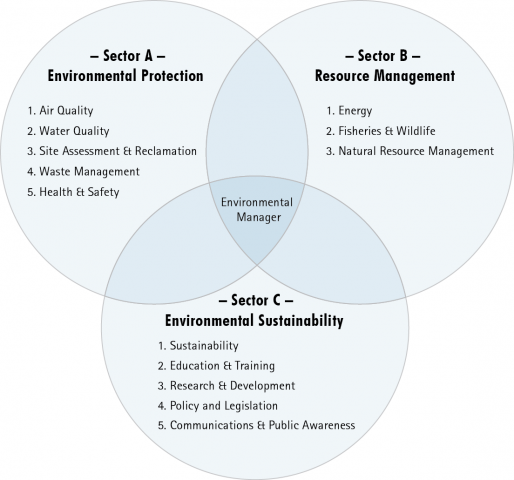 As environmental employment continues to develop and mature, defining the scope of environmental work activities and competencies is essential to ensure a strong foundation and common language for this complex sector. For over 25 years, ECO Canada has worked with industry, employers, and professionals to study the Canadian environmental labour market including setting National Occupational Standards (NOS) for environmental employment. NOS describe the standard acceptable skills and knowledge required to perform a particular occupation competently. NOS are found in various employment areas, such as supply chain, mining or food processing. NOS can also act as a resource for professionals and organizations to improve their capacity and capability. It can be used to help define job roles, measure staff performance and identify and develop routes for progression and professional development. ECO Canada first developed the NOS for Environmental Employment in 1994. They define the skills and knowledge an environmental practitioner must exhibit to be considered competent in their occupation. They consist of over 350 competency statements related to the 14 sub-sectors of environmental employment and include both technical and transferable skills. Simply put, the National Occupational Standards for environmental employment is a comprehensive dictionary that defines what it means to be an effective and competent environmental professional in Canada. These standards serve as the foundation for the certification of environmental practitioners in Canada: the skills and knowledge required to attain the Environmental Professional (EP) designation. During the application process, EP applicants are assessed against the NOS competency statements for up to 5 areas of specialization. They must meet a minimum standard to be eligible for certification for each chosen specialization. Due to the limited experience of Environmental Professionals in-training (EPts), there are no minimum standards for an applicant to meet. However, applicants assess themselves in up to 2 areas of specialization to determine areas of strength and improvement, and to work towards meeting the full EP standards. ECO Canada updates the NOS for environmental employment every 5 years to ensure they remain accurate and capture emerging fields of practice in environmental employment. ECO Canada will be publishing an updated framework for environmental employment that will present the results of 5 years’ worth of research and consultation. Stay tuned for the 2016 National Occupational Standards for Environmental Employment: an Updated Framework for Environmental Employment in Canada.